Sakura Finetek - High-quality paraffin for processing and embedding. Quality prepared wax - allows optimal sample preparation. Paramat is the original British blend of paraffin wax and plastic polymers and it has been used in histology labs throughout the world for over 20 years. It has been found that when plastic polymers are added to the paraffin the elasticity of the final block is greater as compared with paraffin alone. As well the mixture offers improved tissue penetration, easier ribboning of sections, reduced tendency to crumble, and improved overall results with fibrous tissue. A recent development to Paramat is the addition of a very small amount of dimethyl sulfoxide (DMSO) which produces PARAMAT EXTRA. This formulation offers additional advantages, such as faster penetration of the tissue with a more homogeneous matrix to support the specimen. Reduces infiltration time by one-third. Cuts to 2 micron thickness with excellent ribbon continuity. Convenient pellet form melts rapidly. Melting point 56°C. Double filtered. No need for filtration before use. Cuts to 4 micron thickness with excellent ribbon continuity - no Crumbling or cracking. Double filtered. No need for filtration before use. A New low melting point polymer paraffin is introduced in the Peel-AWay line for routine Histology work. These new paraffins are sold in 2.5 kg lined paper and re-closable with a clip bag, and 4 bags per case. Asynthetic polyester wax with a verylow melting point (37°C). Invented by Dr. H.F. Steedman, as a ribboning embedding medium. Its main advantage over paraffin and ester waxes is its low melting point, which reduces tissue hardening, shrinkage, and eliminates the need for infiltration ovens. Polyfin is a mixture of highly refined paraffins and co-polymer alloys in a convenient wax pellet. This unique formulation provides optimal tissue support while maintaining exceptional clarity. Our Polyfin™ has been institutionally tested and found to function flawlessly in pressure/vacuum fluid flow processors. Its low melting point (55°C) eliminates any tissue distortion caused by excessive heat during processing. In a recent study conducted by a Medical Center Histologist, monitored by a CPA firm using standard blind protocols, POLYFIN™ clearly demonstrated the least compression of seven popular paraffins. PolyShield® is a liquid paraffin repellent used as a protective coating on laboratory surfaces that are exposed to paraffin residue. PolyShield® can also be used to clean paraffin that has adhered to lab countertops and equipment. Comes in a 120 ml spray bottle. 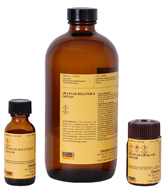 A paraffin repellent for countertops as well as equipment. Just spray and wipe away. No more paraffin build up around your work area. 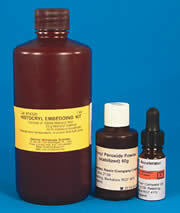 ParaGard™ is a pleasant smelling, non-toxic spray which is safe for use on metal, wood, and plastic surfaces. Comes in a 4 oz. pump bottle. Sakura Finetek - This is a well known water soluble glycol's and resins compound that provides an excellent specimen matrix for cryostat sectioning at temperatures of -10°C and below. It leaves no residue during the staining procedure. This formulation is especially well suited for Mohs cryostat sectioning. It freezes at optimum cutting temperatures of -10°C and below. No residue is left on slides during the staining procedure, thereby eliminating undesirable background staining. An aqueous-based frozen section embedding medium designed to support tissue blocks in cryostat sectioning. Formulated to promote rapid freezing, enhanced sectioning and consistent results at a working temperature of -20°C. 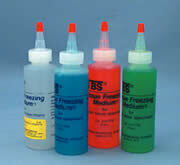 This gel is highly viscous, water-soluble embedding medium for frozen sections that "stays put". The gel is packaged in a pump-dispenser bottle that instantly dispenses the gel in any desired position. The dispenser has a built-in "guillotine" that cleanly severs the gel from the pump spout and prevents any "stringy" medium from pulling away when the bottle is removed. Simply dispense gel on a room temperature block-holder. Use cold heat extractor to form a base layer. Dispense additional gel. Place the tissue on top of gel. Use cold heat extractor to freeze tissue and form block. JB-4 Plus offers all of the same features as JB-4 except it produces less of an exothermic reaction than JB4 which is good for temperature sensitive tissues.